It is a pleasure to inform you that the company Transbit Sp. z o.o. became one of the Business Gazelles – the most dynamically developing Polish companies. On 14 March 2017 in Hilton Warsaw Hotel and at the Convention Centre, the formal ceremony summarizing the Ranking of the Business Gazelles took place. 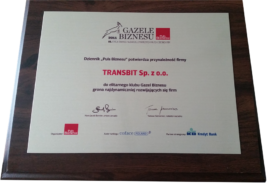 The representatives of Transbit took part in the ceremony and they received the statuette of the Business Gazelles. According to the ranking prepared by Coface on request of the business newspaper “Puls Biznesu” the company Transbit Sp. z o.o. took the 230th place in the mazowieckie voivodshaft in terms of sales revenue. The financial results obtained in three full years before the competition and the continuous percentage increase of revenue determine the place in the ranking. The criteria of the ranking may be found on the official website of the competition – http://egazele.pb.pl/static/kryteria. In 2011 Transbit Sp. z o.o. was placed on the list of the most dynamically developing small and medium companies. The culmination of the XII edition of the Ranking was the Ceremony of the Business Gazelles, during which we were given the statuette confirming that our company belongs to the elite club of the Business Gazelles. The criteria of the ranking may be found on the official website of the competition – http://gazele.pb.pl/static/kryteria . The ranking was prepared by Coface on request of the business newspaper “Puls Biznesu”. In August 2004 our company received a Defender award at the International Defence Industry Exhibition (MSPO) in Kielce for the “R-450A Digital Radio Link” product. At the same Exhibition we received also an award from the editorial team of the Polska Zbrojna magazine for having won a competition for a radio link and for implementation of modern digital communication solutions at the armed forces.